James O. Harris jumps into the wild blue yonder with a member of the Skydive Carolina team. Harris celebrated his 94th birthday with his first sky dive. 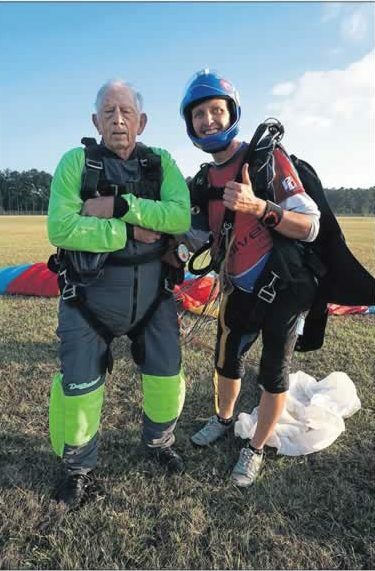 Not every 94-year-old wants to jump out of an airplane on his birthday, but James O. Harris of Dark Corner Road in the Shiloh community did. After landing safely, James O. Harris poses with the sky dive team member. On Saturday, Oct. 14, Harris traveled to Chester, South Carolina, where he was met by skydiving professionals at Skydive Carolina for the adventure of a lifetime. For a man who spent approximately 11 months with Gen. George Patton’s Army in World War II, he said Saturday’s experience jumping from an airplane was a piece of cake. Harris was accompanied in the dive by his daughter Janna, 67, who also jumped for the first time from a plane. He didn’t know Janna was going to be in Chester and would be jumping. Harris said he was surprised when Janna walked up to him in Chester with her skydiving suit on, “I wasn’t expecting it at all,” he said. “I wouldn’t do that again,” she said. “I wasn’t scared to do it, but I didn’t think it would be as rough on the body as it was. It was not a pleasant experience. It was really hard and I was worried about my dad,” she said. But there was no reason to worry about the elder Harris. “I don’t think anybody in the Shiloh community has ever done it, especially at 94 years old,” he said. 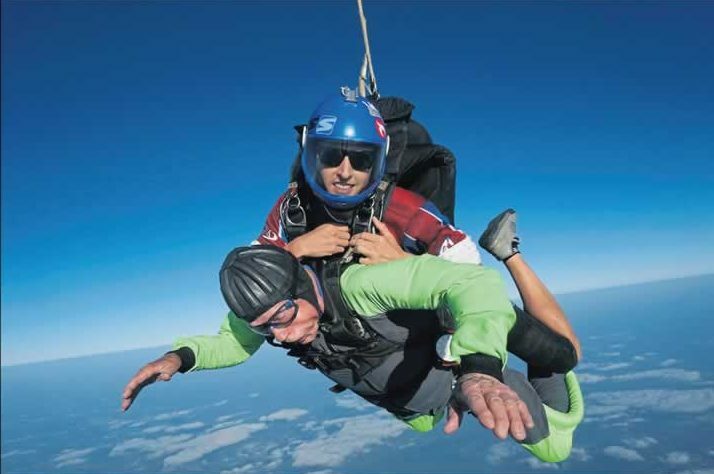 While jumping from 14,000 feet above the earth, Harris said he looked around and didn’t see anybody jumping that looked to be 60 years old, “much less 94,” he said. “That made me wonder if I was doing the right thing,” he said. Harris said the free fall was the worst part. “My nose was burning, we were going so fast I couldn’t really realize what was going on. But when the ‘chute opened, it seemed like it pulled up and up. It was a big jolt and the next one was when you were hitting the ground,” Harris continued. He said it didn’t bother him to hold his legs up as he was preparing to hit the ground. “But it was a pretty good little jump,” he said. Harris said he anticipated Janna would have an easier time jumping than he would, but as it turned out that wasn’t the case. “I’ve always been real active and worked all the time and it wasn’t as hard on me,” he said. He said working for Duke Power for 40 years probably prepared him for the jump. “I figured she could handle it better than I could,” he said. “I’ve always been real active, but her job has been behind a desk,” he said. Janna is a Social Security attorney and lived in Charlotte most of her career. She bought a house in Rutherfordton so she could be closer to her dad and works from her home most days. Janna said as her dad began talking about wanting to skydive on his birthday, she decided she’d jump, too. Two granddaughters also met in Chester to skydive with Harris. 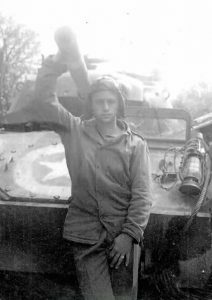 Young James O. Harris poses in front of his gunner tank in WWII. Harris is a 1941 graduate of Cliffside High School and went to World War II right after that. 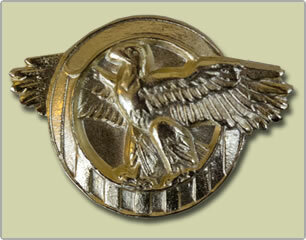 When he went to the Army he acknowledged he was a school bus driver. “So they put me in the tank,” Harris said. “They put me on the big gun and I lost my hearing in my right ear because of the shells exploding. When old age kicked in, I lost most of the rest of my hearing” he said. Harris served in France and Germany in the 2nd Cavalry in Patton’s Third Army and was in five major battles during the war. “I would do it again and I promised those boys, I’d do it again when I turn 100,” he said of skydiving. Harris said he now has something in common with President H.W. Bush, who jumped from a plane on his 90th birthday.